business with pest bird problems. Large or small we can do them all. inspection of your pest bird problems. successful bird control projects done. for pigeons and other pest birds. pest birds make around your home. an end to your pest bird mess. bird proofing under your solar panels. Non-native birds like feral pigeons, sparrows or starlings were introduced into the United States a long time ago and since that time they have grown to become a real problem in Metro Phoenix and Arizona, especially as you may now be learning if the birds are nesting, roosting or pooping on your home or business . Southwest Avian Solutions has specialized in just one thing for the past 17 years - Solving your pest bird problems by developing and installing effective bird and pigeon deterrants with long lasting custom designed pigeon control and bird control solutions for all sorts of residential or commercial buildings and structures throughout Arizona. Our "Certified Pigeon Control or Bird Control Installers" many with 5 - 10 years experience have provided Humane, Discreet, Affordable and Guaranteed Pigeon Removal and Bird Removal Solutions to homes, business's, industrial buildings, state and government buildings throughout Metro Phoenix and Arizona since 1997, with over 6,000 bird control projects completed so far. Call us today and schedule your FREE Inspection and Estimate. With our years of bird control experience in Metro Phoenix and Arizona we can help rid your home or business of pest bird problems with our guaranteed products, guaranteed services and very competitive prices for your home, office or structural pigeon or bird control problems without compromising quality. Did you know that Phoenix pigeons clog roof drains with their feces and nests, a pigeon will poop 47 - 51 times a day, that bird droppings will eat into the finish of your car or that pigeon feces could reduce the life of your roof by 20% or more and if that is not enough it just looks nasty on your Phoenix roof, under the eaves or worse running down the sides of your home or business. 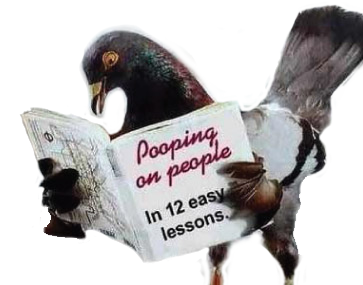 Pest Bird and pigeon feces has even been found to contain over 60 different diseases and if that's not bad enough, there's the 40 plus different parasites that could attack or harm you, your loved ones, pets, employees and even customers or clients. We Guarantee all Workmanship and Installations for 3 - 5 years depending on the project and most of the Pigeon Control orBird Deterrent products and deterrent materials we use can carry up to a 5 year warrantee as well. We can only Guarantee the locations or areas that Southwest Avian Solutions,LLC has installed products on / in and areas that we close off against your pest birds re-entering that location. We can not guarantee that your pigeons or pest birds will not move to some other unprotected locations now or in the future on your home, business or structure that Southwest Avian Solutions,LLC did not protect. We can help solve your pigeon or pest bird problems with our many different discrete bird deterrents to bird proof your residential or commercial property and help you finally put an end to all the hassle, mess and healthissues caused by your pest birds or pigeon control problems on your home or business. Don't wait any longer, call Southwest Avian Solutions,LLC. Monday thru Saturday from 8:30 AM - 5:00 PM at 602.942.6550 or 480.969.2337 to schedule your FREE (Maricopa County) "NO OBLIGATION SITE SURVEY" and a proposal on how we can help you finally put an end to all the pigeon or bird mess and hassle of having to deal with your pest bird problems. Ahwatukee Az, Anthem Az, Apache Junction Az, Avondale Az, Buckeye Az, Carefree Az, Casa Grande Az, Cave Creek Az, Chandler Az, El Mirage Az, Eloy Az, Fountain Hills Az, Gilbert Az, Glendale Az, Gold Canyon Az, Goodyear Az, Higley Az, Laveenj AZ, Litchfield Park Az, Maricopa Az, Mesa Az, Paradise Valley Az, Peoria Az, Phoenix Az, Queen Creek Az, San Tan Valley Az, Scottsdale Az, Sun City Az, Sun City West Az, Sun Lakes Az, Surprise Az, Tempe Az, Tolleson Az, Waddell Az, Youngtown Az, .